I have been chasing down different flavours of Cold Comfort all summer, but I am extremely excited that Autumn has partnered with Leon from my neighbourhood store, Aubergine, to sell her ice cream. I have picked up several flavours of ice cream and sandwiches over the last few weeks, although it has been selling out fast so tracking down this flavour in particular took a few tries! 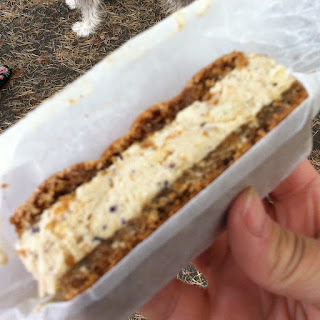 The cookie on the outside was kind of like a brown sugar cookie, maybe like the crunchy top of a butter tart. The inside was a combination of Caffe Fantastico coffee and Fol Epi danish. Yes, probably 13,000 calories but worth every single morsel! 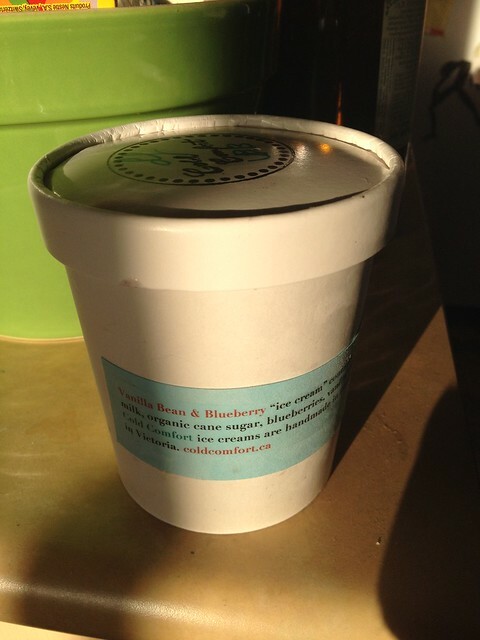 I was originally going to go with the blueberry ice cream with lavender oatmeal cookies (if I recall correctly). Autumn was very sweet and warned that the ice cream was "a bit crystalline" because of all the blueberries. I was still sold until I heard about the "one lonely" cream cheese cake ice cream sandwich hiding in her truck. I do love me a good piece of cheese cake, and I loved this sandwich! 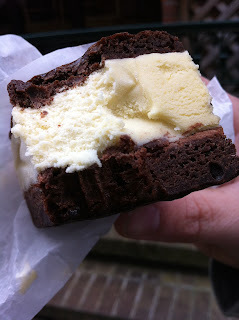 The ice cream was perfect because it wasn't too sweet, and was set off nicely by the chocolate sandwich.